Happy Vishu to everyone! The day that celebrates the Malayali New year is here. But if you are a foodie like us at LatestLY, you know why we wait with bated breath for every festival. In India, no celebrations are complete without food and for such festivals, the traditional food is like a treat for us. Vishu is yet another occasion for us to feast. The Kerala New Year or Vishu will be celebrated on the date of April 15, 2019. The festival on Medam onnu (first day of the first month of the year) is all about new beginnings and auspicious starts. And what better way to celebrate the New Year than with food? If you have ever eaten a Kerala Sadhya, you know that it’s a medley of flavours and textures. From the crispy upperi or chips to the velvety payasam, every morsel is a delight. The food prepared on Vishu is much like that of Onam. There’s a sumptuous Kerala-style lunch with sambar, rice, pappadam, payasam, upperi, pachadi, achar, moru and rasam. If you want to whip up a delicious Kerala sadhya for Vishu 2019, here are some choicest Vishu recipes. Impress your friends and relatives with a delicious sadhya for Vishu 2019. Vishu 2019: How to Prepare Vishu Kani, From Krishna Idol to Grains, the List of Items To Include. 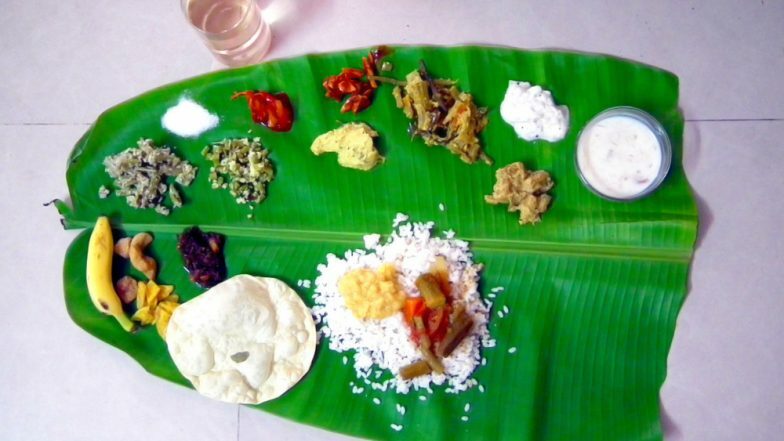 In a Kerala sadhya, you have to eat on a banana leaf, which will be arranged with a wide variety of curries, dry subjzis, accompaniments and desserts. But you can’t eat with a spoon. Here’s a lowdown of all the Vishu recipes. From Payasam to Avial, Here’s How You Can Make Delicious Kerala Dishes At Home! Although sambar needs no introduction, it’s a dish not many people are confident cooking. This lentil-based curry is flavoured with asafoetida, coriander and tamarind. Avial is a Kerala favourite. It’s a curd-based vegetable dish, flavoured with cumin. Here’s an easy recipe to nail this all-time fav! Vishu 2019: When is Vishu Sankranti? Date, Timing, Significance and Story of the Malayali New Year. Rasam and rice is a comfort food. The soup-like rasam is flavoured with tamarind and tomatoes, and has a hint of asafoetida. Pachadi is another curd-based dish. Made with bottle gourd, yellow cucumbers or pumpkin, the curry is flavoured with mustard, cumin, red chillies and curry leaves. Unniappam literally means baby appams. These tiny appams are made of rice, jaggery and coconut, fried (in coconut oil of course) in a special pan. Kootu kari is a gram curry eaten alongside sambar and rice. It has a thick, coconut gravy. Upperi refers to the chips that are served at the sadhya. Fried banana or jackfruit chips are among the first things served. Here’s a sweet and salty recipe for upperi. Thoran is a dry subzi made from one vegetable like cabbage, beans, beetroot or leafy greens. Vishu katta is a Vishu special recipe made especially in Thrissur district of Kerala. The steamed rice preparation is had along with molten jaggery. The pinkish payasam is made by boiling milk to half with rice. The thickened milk is sweetened with sugar. It’s the dessert that evokes a lot of nostalgia. Here’s a simple recipe. There you have it. These Vishu recipes are bound to make your guests come back for more. Try them out this Vishu 2019 and whip up a delicious Kerala-style sadhya. Hope you enjoy these finger-licking Malayali recipes. Wishing you all a Happy Vishu!